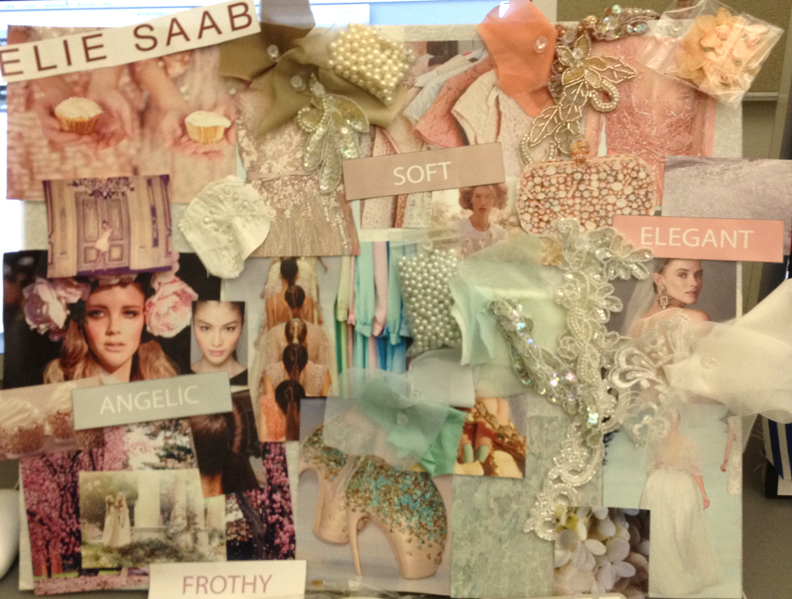 Creating a mood board is great fun and will help you be selective with the research you have gathered. This is the first stage of organizing your thoughts and collected images, enabling you to channel your creative excitement toward a cohesive and targeted design outcome. 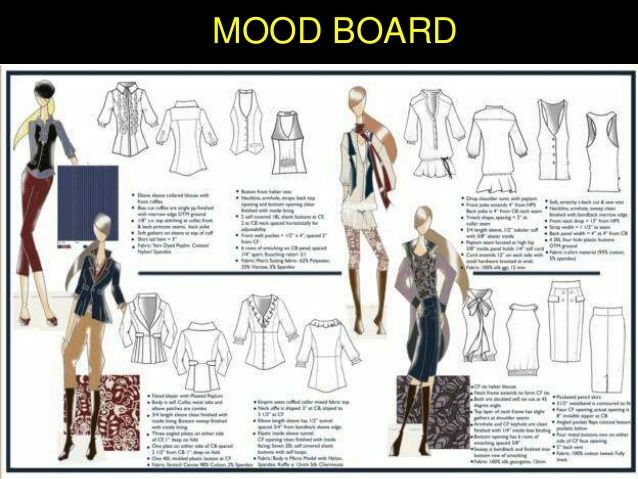 Mood boards are made by arranging images and color ideas on a large board so that you can see at a glance how your designs might evolve. 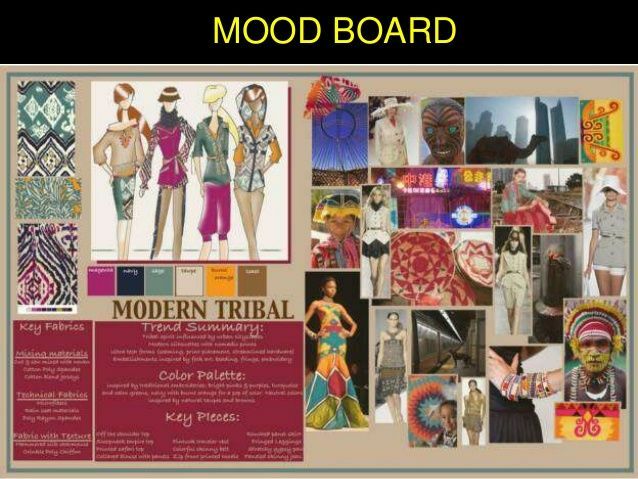 They vary in their complexity but, as the name suggests, mood boards should always capture the mood or flavor of your design project, as well as reflecting your target customer. In grouping your researched images you will have to make decisions about editing and prioritizing your selection, as well as confirming your season and color palette. Colors should reflect your chosen season— soft pastels will suggest a summer story, for example— but whatever the season, the color palette should be applied consistently throughout the project. Select a theme and a season for your work, and consider who your target customer might be. Gather together all your research material. Using a 20 x 30-in. 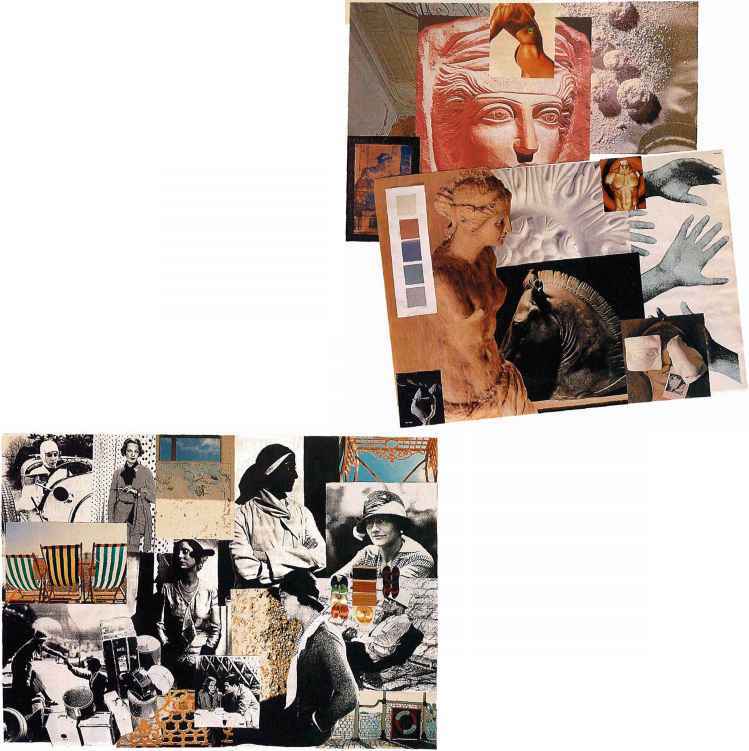 illustration board as a base, arrange and glue together the strongest images, and combine them with a color palette or fabric swatches to make a collage. Also include images from current fashion magazines that suit your chosen theme. Build a mood board that reflects the essence of your design project. • Prioritize images from your collated research. • Reflect your target customer and chosen season. 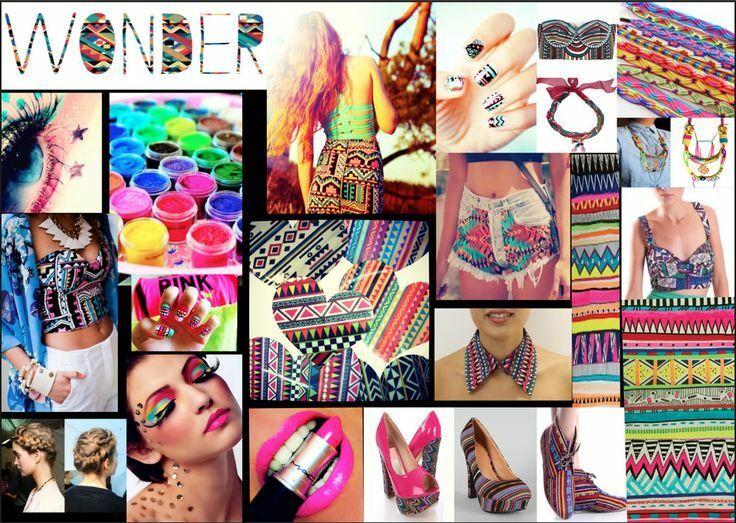 ® Bring together creative inspiration and current fashion trends. Finalize a color palette. 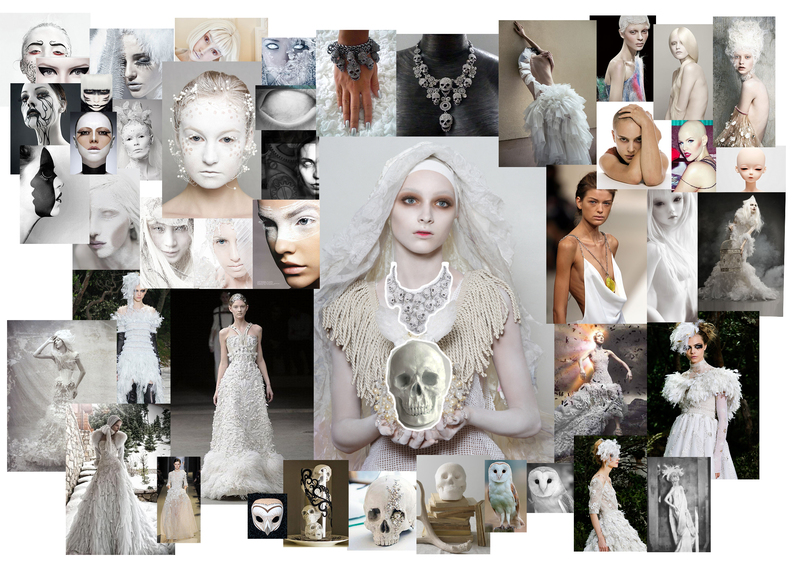 • Create a mood board that summarizes your chosen design theme. If you already have ideas about the fabrics that you will use for your final designs, include swatches on your mood board. Remember to keep the presentation clean, simple, and neat. 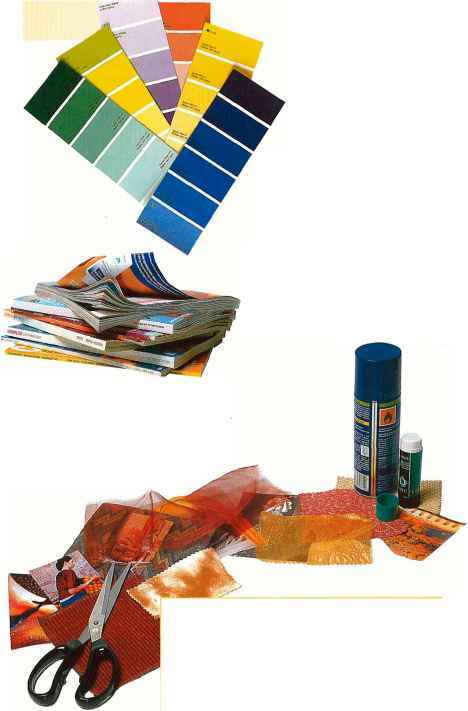 Paint-swatch cards can be used to help you select a harmonious group of colors for your palette. Avoid including more than eight shades in each palette or your designs may become confused and lack cohesion. You should hoard a range of fashion magazines. Pick out current images that support your design ideas and include them on your mood board. • Have you created an easy reference tool to use when sketching your rough ideas? • Have you reflected your season and target customer? • Have you finalized your color palette? • Have you used the most important images? • Have you summarized your theme? 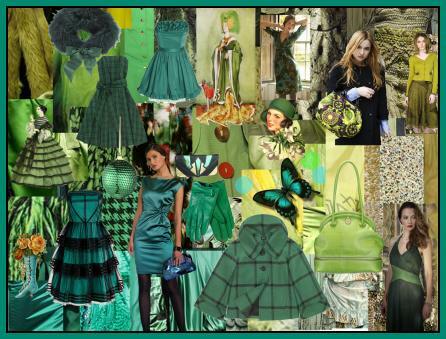 Examine your chosen images together to identify the key shades and best color combinations to evoke your theme. Research a theme that inspires you, gathering items such as postcards, magazine images, and photographs. Selecting from this research will help you focus on what is important in the project. 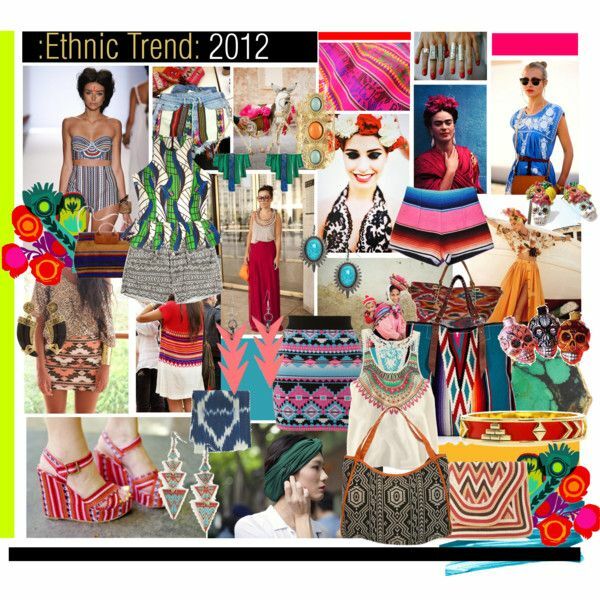 Combine this inspirational research with images and trend predictions from consumer and trade magazines, fashion web sites such as www.style.com, and top designers' web sites. Also gather images to reflect the season and your target customer (see pages 94 and 98). Lay out all your gathered research material so that you can compare the images and select which to use on your mood board. lettering or output copy from a computer. Research widely, linking design concepts. 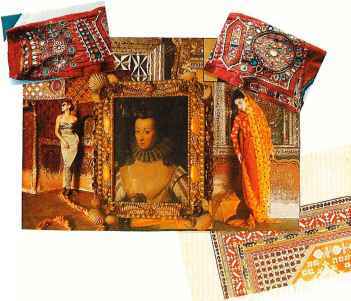 Here, the color and carving of an ornate picture frame is visually married to intricately embroidered fabric and a luxurious sari. because they will detract from the overall effect. Ensure that all the images are cut out simply and stuck down neatly. It is the images that should grab the attention and not the manner in which you have mounted them. Simplest is always best. The classical theme of these boards has been Inspired by the textures and forms of sculpture. A muted color palette, derived from the colors of marble, helps to evoke a timeless and restrained mood. 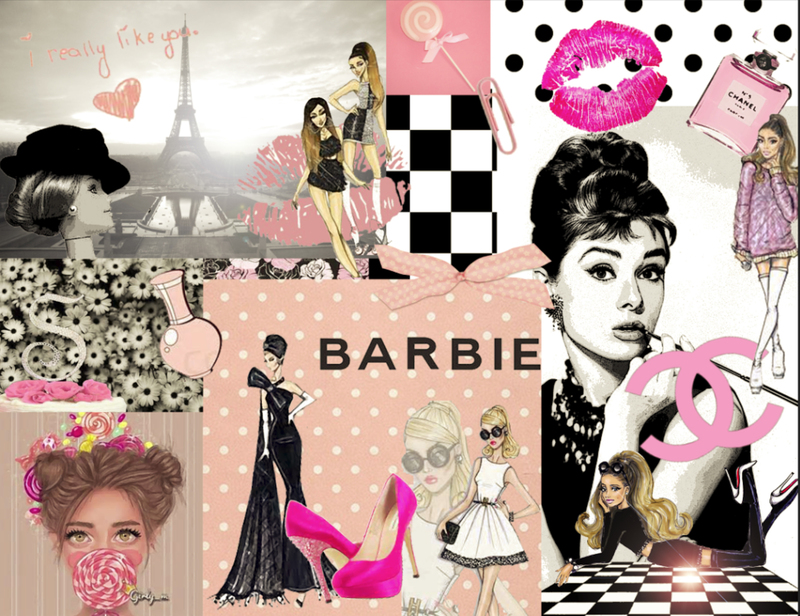 A successful mood board, like those pictured here, has a unique personality. It expresses the essence of the design ideas and sums up the theme as well as reflecting practical concerns such as the season and the target customer. 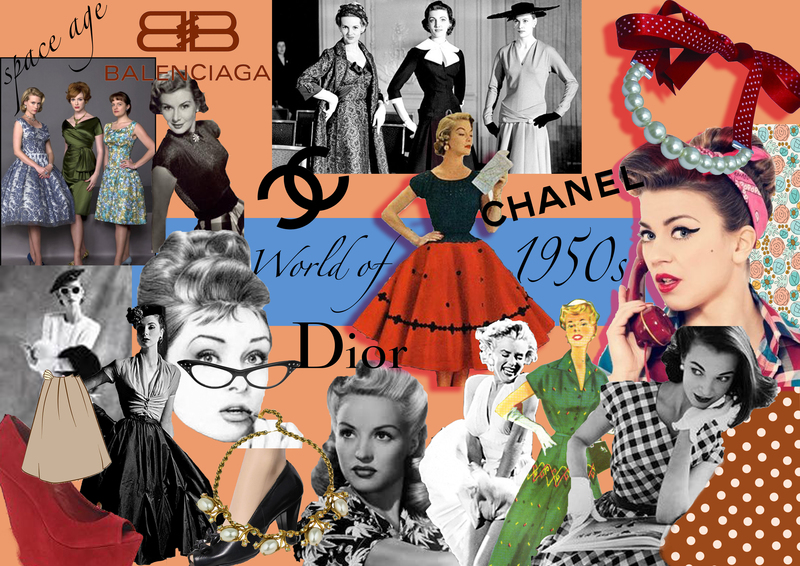 As the board is built up, combining inspirational items with pictures from magazines and information about upcoming styles, creative themes are married with current fashion trends. 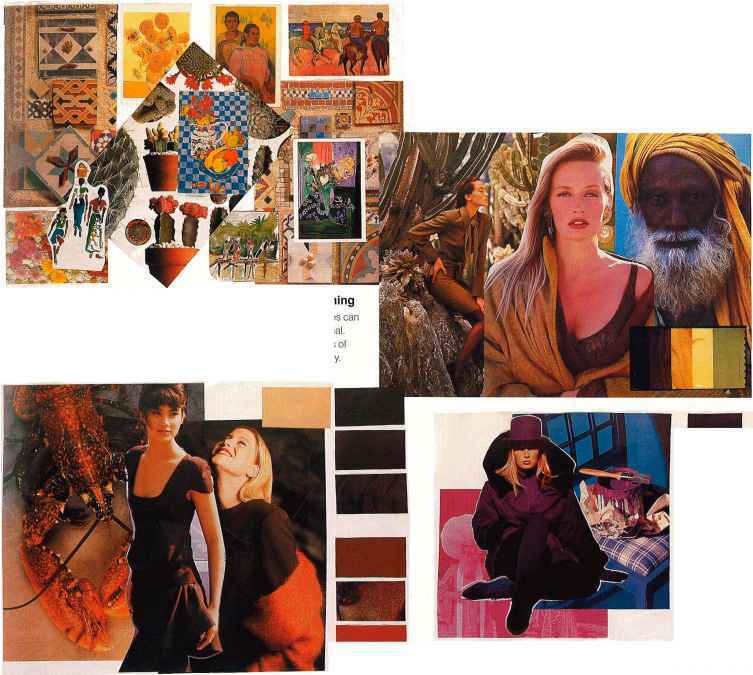 In this way, mood boards provide a focus for a creative yet commercial design solution. The very act of deciding which images to include will help a designer narrow down and develop his or her ideas. As key ideas become prioritized, a clear thought process evolves and the job of producing designs then becomes much simpler. The finished mood board should tell its own distinct story—being disciplined about creating only one board per project keeps creative efforts focused. This board combines the unlikely themes of the seaside and vintage dress (particularly dress associated with travel). The final collection was called "A '20s Trip to the Seaside." 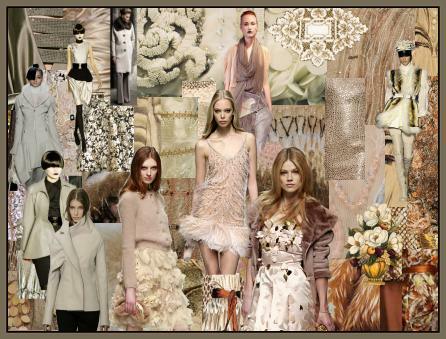 This tonal palette of colors evokes a strongly feminine theme. A high-summer decorative theme has been created in this mood board through an eclectic mix of colorful images. 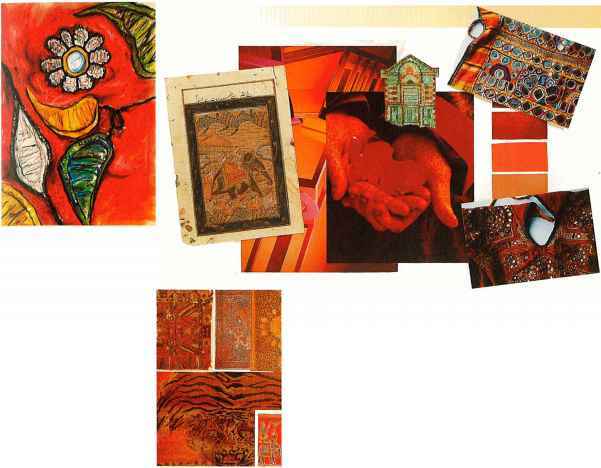 This selection could be narrowed down further still to focus on artists, florals, or decorative tile work. Brown and neutral tones establish a sophisticated mood.